Life-cycle assessment - GDA - Gesamtverband der Aluminiumindustrie e.V. A life-cycle assessment does not usually claim to be completely accurate from a scientific point of view. There are often too many variables and imponderabilities. What are important are the criteria used by those who want to use the assessments for advice on how best to do business. Life-cycle assessments are actively supported by the aluminium industry. Definition of the aim of the life-cycle assessment with a precise conceptual framework and a definition of who the study is aimed at (target group). It is also important here to know whether the study is intended for publication or internal use. Review of the situation for all stages of the life cycle. Where a comparison is made with other products, attention should be given to ensuring the data are completely comparable. Analysis of environmentally unfriendly effects (for example CO2 emissions, quantity of waste, contaminants in water, health risks, etc.). Interpretation/evaluation of the results from an ecological point of view. ISO Standard 14044 defines the requirements and methods for conducting a life-cycle assessment. In the review of the situation, all consumption and emission data of ecological relevance are recorded. In the analysis, the data recorded in the review are aggregated and evaluated with respect to their environmental compatibility and impact. The final evaluation summarises the results and makes a corresponding recommendation. The results are often considered from different viewpoints. Aluminium stand-up pouch or returnable glass bottle? 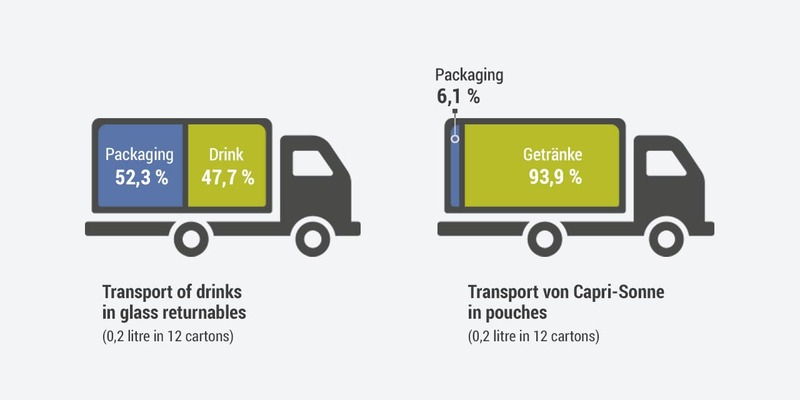 Comparing the transport of beverages makes it clear that compared with returnable glass bottles the use of aluminium stand-up pouches means almost twice as much content can be transported within the same space (as in the example of Capri Sonne); emissions can thus be reduced considerably. The aluminium beverage can also offers benefits compared with the heavier glass bottle. Furthermore, aluminium beverage cans can be readily stacked during transport. The higher bulk density allows relatively more drinks to be transported with less packaging – and that is what matters. After all, the consumer wants the drink and not the packaging. A life-cycle assessment does not usually claim to be completely accurate from a scientific point of view. There are often too many variables and imponderabilities. What are important are the criteria used by those who want to use the assessments for advice on how best to do business, such as a packaging plant that wants to know if it makes ecological sense or not for it to change over to aluminium packaging. As mentioned earlier, a decisive factor with life-cycle assessments is ensuring comparability of the data. It would be of little use to only include, for example, the production effort in any comparison without at the same time considering the demands made on the product during its use. Here it is important that comparisons are not made based on a kilogram of material because aluminium products are light. One can manufacture 60 cans from a kilogram of aluminium, which can be used to package 30 litres of drinks. In contrast, only three glass bottles can be made from a kilogram of glass, and the beverage content is merely one-and-a-half litres. Similarly, in the building industry, about twice as much roof area can be produced from aluminium as from an equivalent weight of steel. These are factors that benefit aluminium products when it comes to a life-cycle assessment. If parts are in motion, such as in a car or truck, aluminium is at an advantage in any case. Life-cycle assessments are actively supported by the aluminium industry. Collection of aluminium by industry and households makes sense because the metal can be recycled in an energy-saving manner.